The good news: chocolate can be beneficial for your heart and help keep your heart pumping at a healthy rate. This benefit, however, depends on the amount and the type of chocolate you consume and your overall body weight. In moderation, low-sugar, dark chocolate can be a healthy part of your weekly -- not daily -- balanced diet. A strong heart requires healthy arteries and veins, the vessels that circulate blood to the heart's chambers and throughout your body. A study published in 2007 in "Circulation," the journal of the American Heart Association, notes that chocolate is rich in antioxidants called flavonoids, which may help to lower blood pressure. Additionally, these antioxidant compounds help to dilate the blood vessels and reduce the risk of blood plaques and stiffening in arteries. Balanced blood pressure combined with elastic blood vessels helps to reduce the stress on the heart and keep your heart rate healthy. Like tea and coffee, cocoa beans naturally contain caffeine. The University Health Service at University of Michigan notes that caffeine, a natural stimulant drug, can exert an effect on the central nervous system for up to six hours. In moderate doses, up to 250 milligrams or two 6-ounce servings of coffee, it can make you feel more alert. Caffeine causes an increase in heart rate, body temperature, blood pressure, blood sugar levels and blood flow. Too much caffeine can lead to dizziness, low blood sugar levels, muscle tremors, nausea, diarrhea, thirst, irritability and insomnia. A 1.5-ounce serving of dark chocolate gives you 20 milligrams of caffeine, while a 1.6-ounce serving of milk chocolate contains 9 milligrams. Hence, you would have to eat quite a bit of chocolate to get the stimulant effects of caffeine. Some individuals can have an adverse reaction to chocolate due to chemicals such as theobromine, which are naturally found in cocoa. The World Allergy Foundation notes that food allergies can lead to anaphylaxis, a condition in which the body reacts by going into shock, typically causing low heart rate, low blood pressure and irregular heart rhythms. You may also experience asthma, swelling and a skin rash. An allergic reaction to chocolate or other food can be life-threatening; seek immediate medical attention. Heart rate is affected by body weight. Excess pounds can put pressure on your artery walls and increase blood pressure and heart rate, as you heart works harder to pump blood to your body. Hence, eating too much calorie-dense chocolate can lead to weight gain and negatively affect your heart health. Milk chocolate tends to be higher in fat and sugar and lower in antioxidants than dark chocolate. 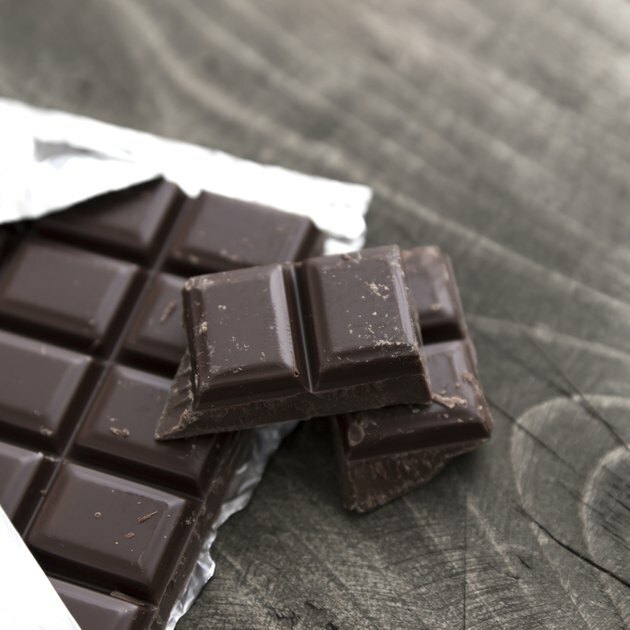 A nine-year study among Swedish women published in 2010 in the American Heart Association's journal "Circulation: Heart Failure" found that middle-aged and elderly women who had an average of one to two servings per week of antioxidant-rich chocolate had a 32 percent lower risk of developing heart disease. But those who ate one serving a day or more no longer had the heart-protective benefits of chocolate. How Much Chocolate Is Safe When You Are Pregnant?